The PS-USB from Brecknell Scales is ideal for shipping and warehouse applications. It features a RS-232/USB interface allowing instant connectivity between scale and other serial device using a demand type protocol. Standard NCI default with field configurable settings of NCI, 8213, 3835 and Autosend. Removable stainless steel platter and operates on either battery or AC adapter. 30, 70 or 150 lb cap. 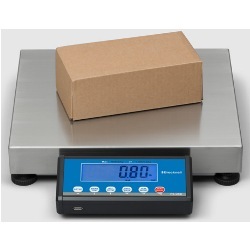 Sometimes you just need an affordable shipping scale that displays the weight accurately and consistently. That is what you get with the Brecknell PS-USB shipping scale. The scale is versatile and easy to use, which is a standard feature with Salter Brecknell Weighing Products. The Brecknell PS-USB is a very good choice for shipping and warehouse applications where portability is important in your weighing process. The PS-USB includes a RS-232/USB interface allowing instant connectivity between scale and other serial device using a demand type protocol. Standard NCI default with field configurable settings of NCI, 8213, 3835 and Autosend. The Brecknell Shipping Scale available from Central Carolina Scale is constructed of a heavy duty cast aluminum base with removable stainless steel platter, adjustable feet and leveling bubble for precise weighing in just about any situation. The Brecknell PS-USB operates on either battery, AC adapter or USB enabling portability or permanent installation. 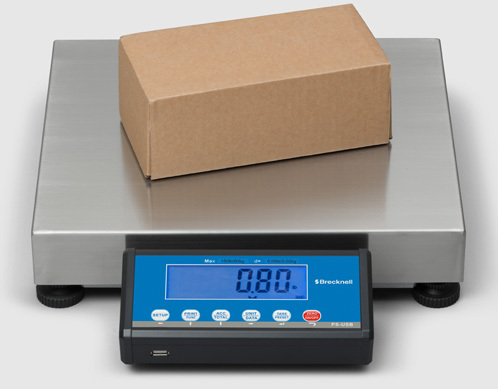 PS-USB scales are particularly suited to shipping and warehouse applications and general purpose weighing. 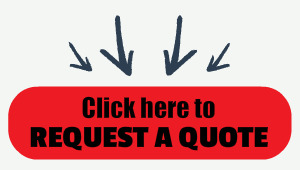 These are very affordable scales with high accuracy. The triple power modes (battery, AC adapter and USB) enable portability or permanent installation. The PS-USB features RS-232/USB interface that can transmit and receive using a demand type protocol. Comes with adjustable feet and leveling bubble for precise weighing.